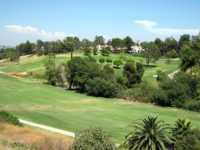 Fullerton Golf Club is an 18 hole course with a par of 67. The Rye fairways with bent grass has a rating of 65.4 and a slope of 114. The course has a length of 5,159 yards from the back tees, making this course perfect for experienced players. The greens can be challenging if you are a little bit off your game. It was designed by William F. Bell is 1970. There are some bunkers and water hazards that come into play as well as elevation changes throughout the course. You can find cheap golf in Ful llerton by looking up the prices online. Fullerton Golf Club tee times are listed online, and you can book your tee times in advance before you come to the club. The Fullerton tee times includes cart rentals. You can either play a full 18 round of golf, or you can play the back nine. You can enjoy a meal with friends or clients at the full bar, or you can enjoy a meal and the cafe. If you are a beginning or just need additional lessons, the course offers instructions by a professional. There is also a practice facility with putting greens available so that you can practice your short game. The fully stocked Pro Shop has everything that you will need for a great day of golf.